Are you worried about asbestos in your home, commercial property, school, or another property? Asbestos is a very serious carcinogen that has been found to be harmful to human health. Asbestos was used in almost every property before the 1970s because of its excellent fire retardant and insulating properties. So many properties in the US were built before asbestos was discovered to be harmful, and lots of them are still being used today. To keep inhabitants and visitors safe, it’s important to have every property tested for asbestos. Thankfully if you own or manage a property in Los Angeles, CA, H2 Environmental Consulting Services is here to meet all your asbestos testing and remediation needs. Call us at (800) 524-3578 to determine whether there is asbestos in your residence or business and get this problem corrected. Where could asbestos be in my property? Though asbestos is a naturally occurring material, it’s important to limit exposure to asbestos because it has been linked to various diseases including asbestosis (a lung disease that causes scarring on the tissues of the lungs which limits the ability of oxygen to enter the bloodstream), mesothelioma (a cancer affecting the lining of the lungs, abdomen, chest, and heart that often shows up many years after exposure), and lung cancer. These diseases can take up to 30 years to develop. Prevent all exposure to asbestos to ensure continued health and safety of all who inhabit your property in Los Angeles, CA. Concerned about asbestos on your property? 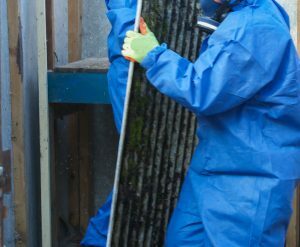 If you don’t know whether your property contains asbestos, you should find out now by calling Los Angeles’ top asbestos company – H2 Environmental Consulting Services. We’ll be happy to schedule a thorough evaluation of your property to check for asbestos, lead, mold, fungus, and other common contaminants throughout Los Angeles and Southern California in general. If asbestos is found on your property, you can also count on H2 Environmental Consulting Services for complete remediation services. That means we’ll safely remove all asbestos-contaminated materials from your property and dispose of them in accord with all federal, state, and local regulations. We’ll also complete final testing to ensure all asbestos fibers have been effectively removed from your property. If you operate a business that includes the handling of asbestos, it’s important that your employees and staff know how to deal with it properly without exposing themselves or anyone else to this harmful material. H2 Environmental Consulting Services is Los Angeles’ (and Southern California’s) top asbestos company, so we’ll gladly provide impeccable asbestos training services to your employees. Schedule today by calling (800) 524-3578. For all your asbestos testing, remediation, and training needs in Los Angeles, call H2 Environmental Consulting Services at (800) 524-3578.